First Brompton I was aware of was the one of my friend Mathilde. Owning it for only two hours she presented it proudly to a bunch of friends. „Look, how it can be folded! How easy to carry!! And so easy it unfolds …. uhm..“ Ok, it took us some minutes to see what has to be unfolded first. Mathilde’s happiness is still going on. Since I got mine, we do short trips with the little ones. 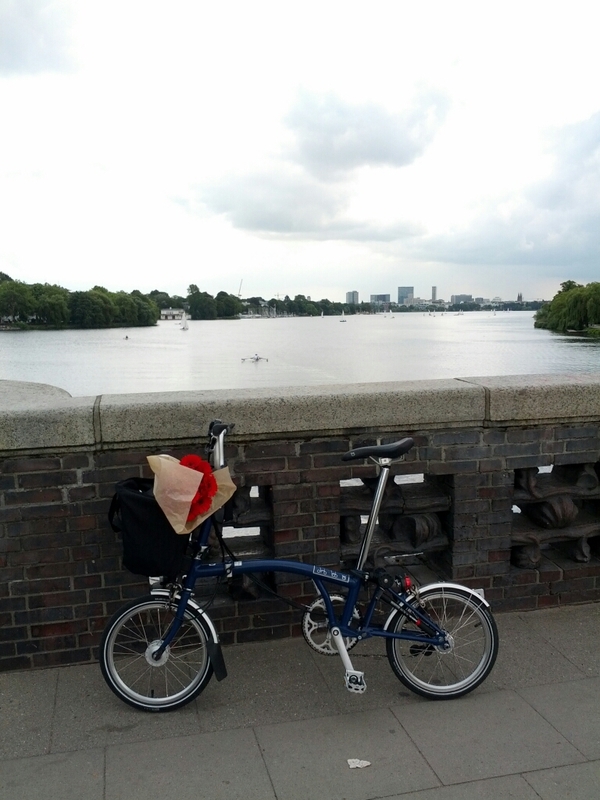 Short trips, because often we have to stop for pics of the bikes..
You see, my first impression was Bromptons are perfect bikes for women. Then I met Patrick from Boxbike who wanted to know what could make a Brompton more attractive to women. I was surprised by his question. Reviewing the feedback I get on the bike and seeing my fellow competitors at Brompton National Championships, I got aware that these bike are mostly ridden by men. Time to change that! Pardon, my enthusiasm for the little bike carried me away.. It took me quite a while to find the right angle and position until it felt comfortable. One Bromptonaut directly advised to change it. I think it’s a personal decision which kind of saddle you prefer. The original saddle has the advantage of „finger rails“ for easy carry. Next time, I wouldn’t try so long on my own but go directly to the Brompton Store for advice. I couldn’t find a good position using the originals w/o getting a tensed neck and back. Lucky me, the Brompton Store Hamburg people are really helpful and enthusiastic about the bike. The owner only asked „do you mind the color? These ones would suite your bike perfectly but they are the same. Here I’ve got ergonomic ones – grey in grey.“. She was direct with the options, I took the ergonomic ones, got them mounted on the go and am happy with them. My favourite accessory is the basket! It takes 20l / 10kg. Never I would allow a basket on my trekking bike. This one is different. It’s front mounted on the frame. It doesn’t move when you turn. A handbag + water bottle + coat easily fit inside. Half folding the bike you can use it as a trolley. It is super easy to put and remove. Most asked question is „isn’t it difficult to ride with its small wheels? don’t you have to kick the pedal twice as much as on a normal bike?“. No. Concerning the 16″ wheels it’s similar to thin racing wheels. Just pay a bit attention when crossing rails or riding over cobble stone. Personally, I had only one strange experience: avoiding being overrun by a tractor in the country side, my wheels got stuck in the grass border, stopping me abruptly. My Brompton weights around 12.5 kg. It could be lighter if I hadn’t chosen six gears and a hub dynamo. I use every gear in town – happy to be first crossing the lights. Same I do with my trekking bike, that’s why I went for the six gears. The hub dynamo is luxury and laziness. I just don’t want to carry battery lights with me all time in case I would need them. You can choose out of multiple colors, even mix them. Standard colors blue, orange, white and black are always in stock. ..that’s why mine is blue. I really wanted to ride it as soon as possible. Otherwise, I would have gone for arctic blue or blackberry. Now, I’m happy with cobalt blue and – if I buy it – will put some light blue accessories. 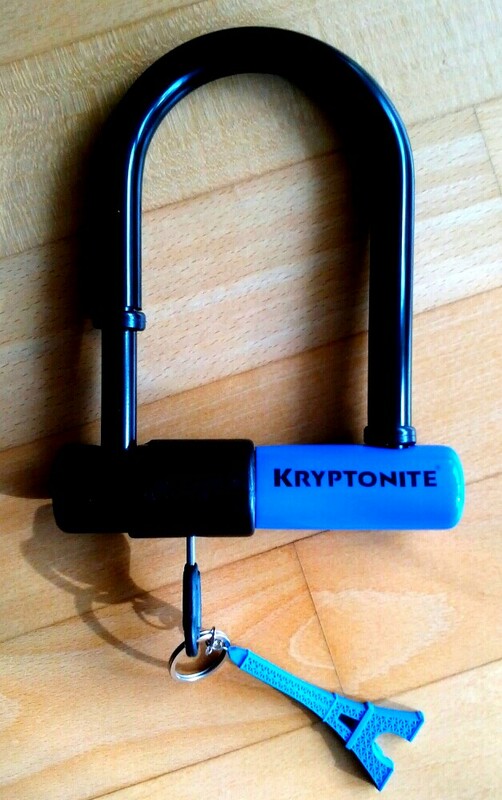 Orange kryptonite turned light blue to fit my little bike. I want to have it in „my style“ and my colors. For now it’s the shoes and lock that mix. Riding the little bike is nearly the same as my trekking bike. Only it reacts faster to direction changes. I had to get used to the short handle bar which reminds me of a single speed. Some rides and I got used to. There’s only one thing I didn’t dare doing yet: riding „hands free“. The steel frame assures a stable riding. ..I always prefer steel over alu bikes. Another reason to go for the Brompton. 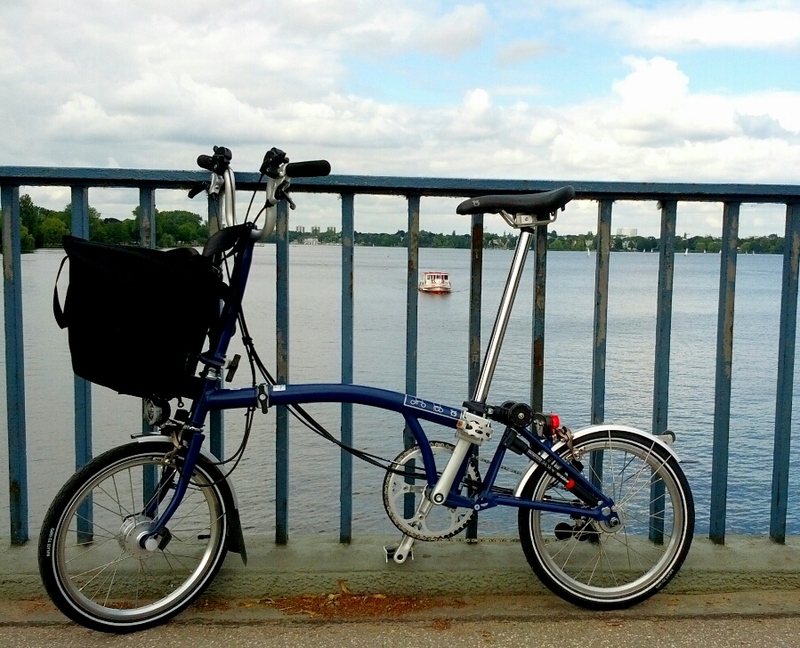 If you’re not sure if you’ll be as enthusiastic about the Brompton as me, I would recommend to test ride it. In London, you can hire it for city rides. Brompton Junction London would be my first choice to test different models, getting answers on all my questions. Nicole from LondonCyclist did a great review some years ago. On twitter lots of Brompton lovers post stuff about their bikes, give advice. 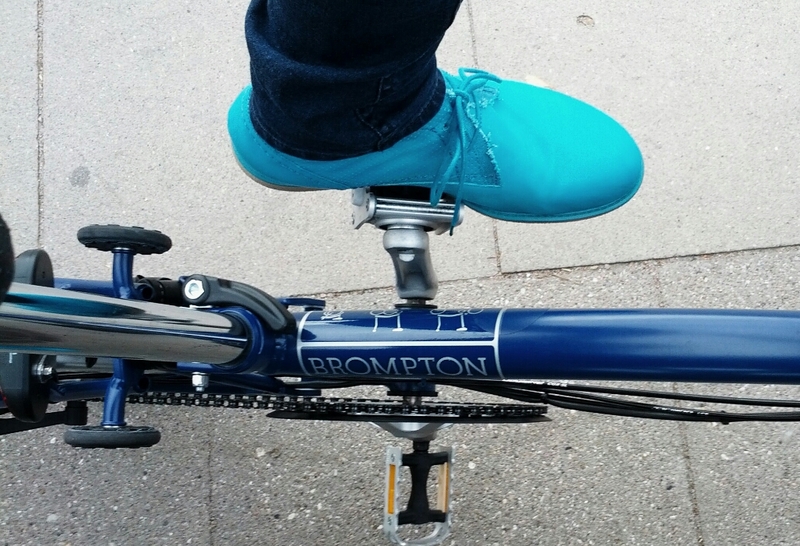 „My Orange Brompton“ (@LondonBrompton) shares its rides and experiences. I hope to have answered the questions!